Since the middle of last year, when Kiko stove (ecology stove) was introduced by KGA with the help of a JICA Volunteer Ms Yukiko Kasuya, many community in Solomon Islands had benefited from the program. Training and demostrations were carried out in Choiseul, Western, Makira/ Ulawa, Malaita, Central and Guadalcanal provinces including Honiara. Today, those trained had made stoves for their own kitchen and some had even made extra income by selling the stoves for $20.00 – $30.00 each. Ms Yukiko and Roselyn Kabu were exited about the positive feedback from the communities/ villagers involved, especially the fire efficient nature of the stove which has greatly reduced the smoke from kitchen fire. The Kiko stove uses less firewood to cook family meals which means reducing the burden of rural women carrying firewood for their cooking needs. With the high demand for training on how to make Kiko stoves, Ms Yukiko had recently held workshops at Nana RTC and Namuga in East Makira. A total of 50 participants attended of which most of them are women. The participants were so happy to learn about Kiko stove making. At Nana RTC, Ms Yukiko had also introduced how to make Kiko baking oven (earth oven). After the workshop a Life Skill teacher said, “We have a problem with our drum oven so we couldn’t bake bans, but now we can bake it using the Kiko oven”. I’m very happy about the Kiko oven as it is very simple, easy to make using local materials with no external input, she commented. She will pass on the skills to her students at the Rural Training Centre, as part of the life skills training. Mrs Roselyn and Yukiko had applied the same idea of kiko stove to make baking oven. 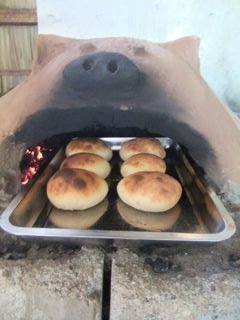 We made Kiko baking oven (earth oven) in Busurata (Central Malaita), KGA Burnscreek and Kirakira in Makira/Ulawa province. The oven doesn’t need a drum. It only needs clay soil, sand, ash, coconut husk and water so that it is good for people in the rural area. At the KGA Burnscreek, we started to use this oven for baking pizza and bans, Ms Yukiko said. The taste is so nice as other outlets in town.